Discover the Isora Viewpoint in El Pinar, El Hierro. Copyright David Olivera. offered by Cabildo de El Hierro. 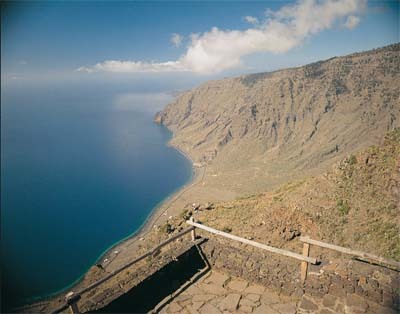 The Isora Viewpoint is located nearby the town of Isora in the municipality of El Pinar del Hierro, on the Southeast of El Hierro, in the Canary Islands. This is one of the best viewpoints on the island of El Hierro as it’s localized in a natural beautiful area and, from here, you might see the whole El Golfo region from a considerable height. It’s interesting to know that from this viewpoint starts an enjoyable trail that passes through Isora and it goes all the way down to El Golfo, where the Parador Nacional de El Hierro is located and where you might also stop for a drink or snack. This is a highly-recommendable route and it’s not very long. Isora, El Pinar de El Hierro, El Hierro.